You scream, I scream, we all will scream for Graeter’s ice cream. This renowned ice cream brand from Cincinnati, Ohio, has been making ice cream two gallons at a time since 1870 when the company was founded by Louis Charles Graeter. Four generations later, the same French pot batch process is used today. That French pot is the secret to their success along with quality all-natural ingredients. To begin each labor intensive batch, fresh cream and egg custard is placed into a chilled, spinning French pot. 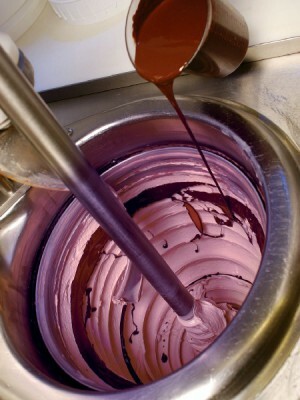 As it swirls the blend thickens, and a blade scrapes the side of the pot, folding the ice cream. This folding process prevents air into the ice cream and accounts for the dense and creamy consistency. Graeter’s ice cream is so rich and creamy every pint is hand packed and weighs nearly twice than your typical pint of ice cream. While Graeter’s is outrageously creamy, it is the bittersweet chocolate chips that set this brand apart from the others. Their signature chocolate chips are prepared by pouring liquid chocolate into the French pot as it’s finishing, resulting in a thin shell on top of the ice cream which a worker breaks up and mixes into the ice cream. These chunks of chocolate vary in size, but each one is intensely chocolaty and smooth. Graeter’s had been a long-time regional favorite, but it gained national attention after a personal endorsement by Oprah Winfrey, she said “You haven’t had ice cream till you’ve had Graeter’s. The butter pecan is Stedman’s favorite, and mine, too.” This made Graeter’s an instant national success. About 40,000 packages of ice cream are shipped to fans each year. You can pick a variety pack or choose your own from the available 24 flavors. Premium, hand-selected Oregon black raspberries go into every batch of their top-selling signature flavor, Black Raspberry Chip. I’m rarely fond of Vanilla flavored ice cream but Graeter’s changes that by freshly grinding whole Madagascar vanilla beans with sugar before blending into every batch. Specks of vanilla bean can be seen in every scoop. Those flavors are indeed delicious, but my personal favorite is the Mocha Chip. The robust flavor from the Arabica coffee beans melds with the rich chocolate chips creating a decadent treat. Online shipments can run $80.00 to $120.00 for a 6 or 12 pints, but now fans in Las Vegas can select from many different pint flavors at their local Smith’s. “We are excited to offer the taste of Graeter’s to ice cream lovers in Las Vegas,” said Richard Graeter, President of Graeter’s. Distribution was previously limited to 45 ice cream parlors and pint sales at 1,500 Kroger supermarkets throughout the Midwest, Texas and Colorado. But now Graeter’s ice cream pints can be had coast-to-coast. Pints of Graeter’s ice cream are $4.49 each in area Smith’s stores. Because of the small batches and high labor involved Graeter’s varieties are more expensive than other brands of premium ice cream, but it is well worth the extra pennies. I just learned a manufacturer’s coupon for $1 off is available on coupons.com A regional zipcode is needed, use 77046 to print the coupon, it can be redeemed at any Kroger/Smith’s store and is valid until 6/12/11. I grew up in Cincinnati, so I was lucky enough to have known about Graeter’s ice cream for years. The chocolate chip flavors are my favorites but they also have great seasonal flavors like eggnog sometimes. Their chocolate candy is excellent too, and available from the online store but is only shipped during the colder months.